During the past couple of days the food blogging community has been abuzz after unearthing thefts by one of the oldest and popular TV channels – Zee Network. This came as a shock to me, since I was a victim of plagiarism by FoodHall, just sometime back. It brings to light lack of ethics in the Corporate world. 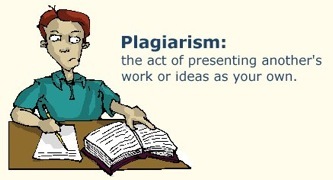 This post is all about what plagiarism is, and the instances of plagiarism that have come to light recently. With this post I hope to create awareness about the owner’s right to content posted on the net. What is plagiarism or copyright infringement? The act of stealing lines, photographs or any other content from others and passing it off as one’s own is plagiarism. If the body of work from where the content was stolen carries a copyright information, then the owner’s permission must be sought before use of the photographs. Some sites allow sharing of content under certain conditions, but not all. Every work has different terms and conditions. Feeble excuses given by violators include, that the photographs were taken because they appeared in a public platform on the internet. I am sure that most of us are aware that every site carries a copyright information, just like the sites maintained by Companies and Corporates. No content, written or photographed is available for free unless specified. Even if a photograph on a site is not watermarked, it is still under copyright protection as it falls within the definition of ‘content’. This means that trademark logos, and images of any company or individual cannot be taken for free. Khana Khazana is a popular show aired on Zee Network. 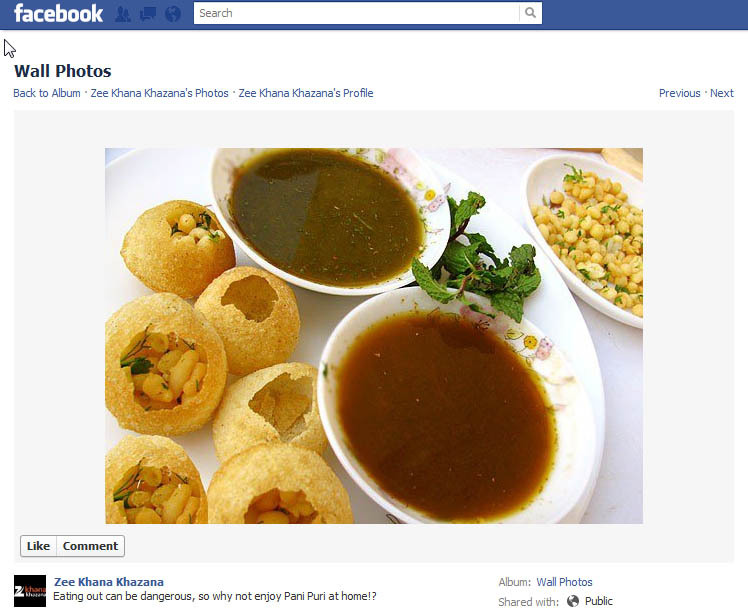 It also has a page on Facebook that goes by the name ‘ZeeKhanaKhazana’ [hereinafter referred to as ZKK]. The page is said to be dedicated to food, and recently we [the community of food bloggers] found that they are also regularly stealing photographs from food bloggers and websites for their features. 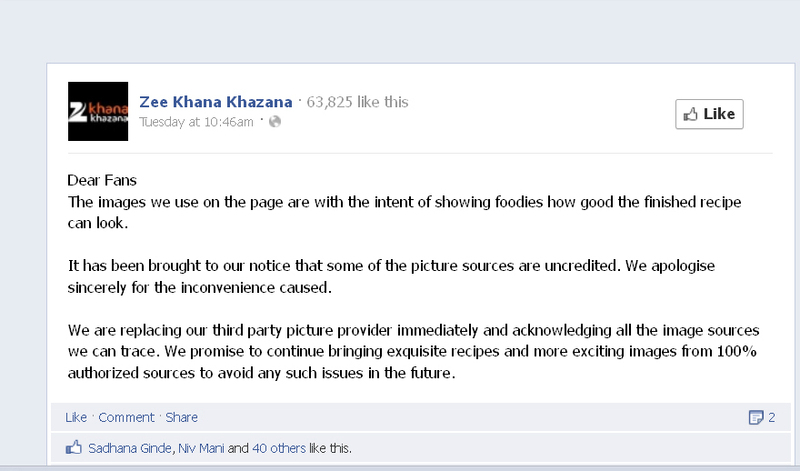 When Aparna, Soma, Manisha and Alka, whose photographs were stolen and featured, complained and asked Zee Khana Khaza to remove the photographs that belonged to their blogs, ZKK apologized saying this was not stealth and that they were using these images to project a visual appeal of their recipes to their ‘fans’. For long the food blogging community have been victims of plagiarism by big and small sites, print and electronic media. The fact that bloggers are individuals and not in a position to defend their content, makes them easy prey for such corporate bodies. However, the present incident [with ZKK] showed rampant copyright infringement. We decided that it was time for food bloggers, those who were victims and those who were potential victims, to unify and take action. Many of us voiced ourselves on the facebook page of ZKK, and reported the page to Facebook also. Some of us were cautious enough to take screen shots of the posts as evidence. An apology claiming ignorance by a corporate body is not easily digested, is it? We, food bloggers, who provide our readers, recipes tried, tested, and photographed by us, request everyone to follow our blogs rather than unscrupulous pages. 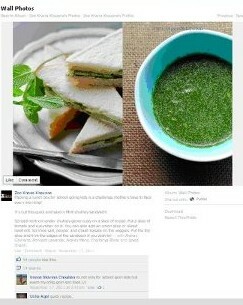 It appears that the recipes shared are not tested, and hence they choose to post them with our photographs. Food bloggers whose photographs are used by such unscrupulous sites are neither informed about the use, nor are they credited, leave alone purchasing! 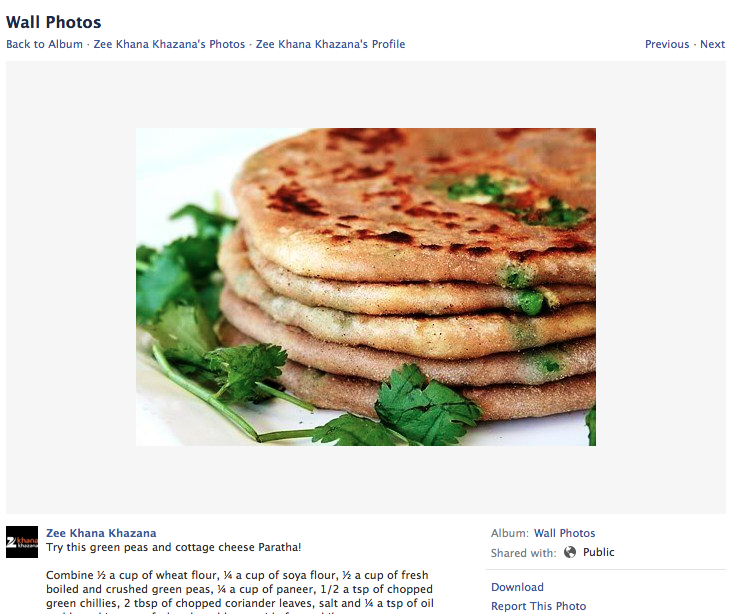 We appeal all food bloggers to check up whether their photographs have been stolen, and if so please take screen shots of the same and report the page – ‘ZeeKhanaKhazana’ to Facebook for copyright infringement. That way we can get the page removed from Facebook. Please follow the link here to report copyright infringement to Facebook. Alka Keswani, food blogger at ‘Sindhi Rasoi‘. It is not only ZKK that is involved in copy right violation. I was a victim too, when FoodHall, a gourmet store at Palladium Mall, Mumbai, belonging to ‘futuregroup’, stole a photograph consisting of three images put together. 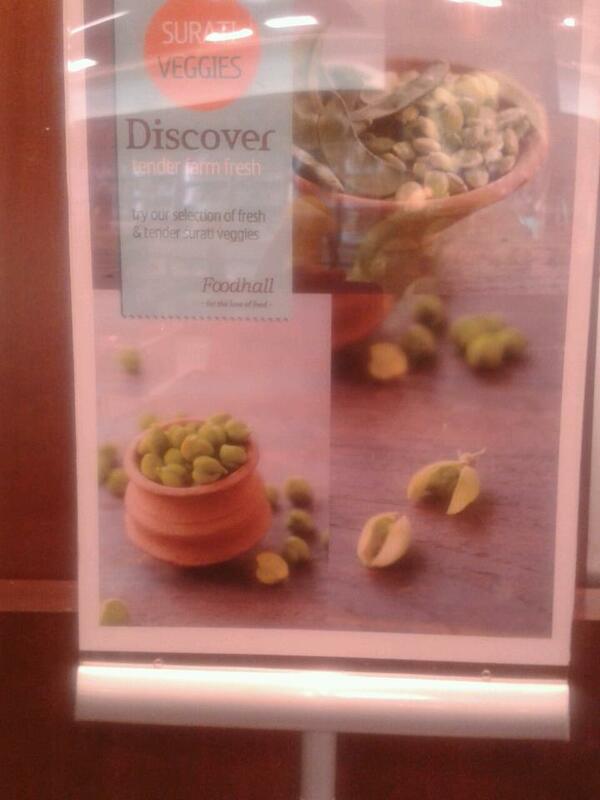 It was used by them in their store to advertize seasonal vegetables on a screen. None of the mails written by me have been answered by FoodHall so far. Is ignorance a valid excuse? Both the cases above show that the infringement was made by corporate bodies with considerably large presence in India and abroad. When such bodies claim that the photographs were lifted out of ignorance, is it acceptable? In that case why do these companies register their logos and trademarks? These are points to be pondered on. The future is going to be very bleak if corporates succumb to such unethical behaviour. There was a factual error in assuming the association of Chef Sanjeev Kapoor with ZKK in the original version of this article. I aplogize for the same to Shri.Sanjeev Kapoor. Shri. Sanjeev Kapoor has clarified that he is no longer associated with ZKK, the TV Channel, website or any of its social media activities. Thanks to Mr.Adarsh, for clarifying the issue and bringing it to my notice. Harini Prakash also known in blog world as 'Sunshinemom', is the author, cook and photographer of 'Tongue Ticklers', a food and food-photography blog that offers insights into vegan lifestyle, family stories and eggless, dairy-free, recipes. She resides in Thane, with her husband and two lovely children, who decide whether or not a dish makes it to the blog. You can reach her at 'harini[at]tongueticklers[dot]com.